But today I’m asking myself: Why does this story need to be told? When I met with Scott Rosenberg last week, he reminded me of another of Mozilla’s founding stories. It was the story of when Mitchell Baker was known as “Chief Lizard Wrangler” and general community manager for the Mozilla Project. Mitch Kapor turned to her for general advice on building an open source community when he decided to start the Chandler Project almost ten years ago. This early collision of two nodes are part of a chain reaction that is responsible for a network that is more than 400 million nodes strong today. These stories are enjoyable artifacts of a time when technology was as idealistic as it was enterprising. But, frankly, I don’t think that either of these back stories is what’s interesting or exciting about Mozilla today. What is genuinely exciting is the enormous global community of makers and hackers that are coalescing around the projects, events, and ideas that are coming out of Mozilla right now. The big challenge, however, is helping people find their way through this bottom-up, globally-distributed, network of opportunities to get involved. 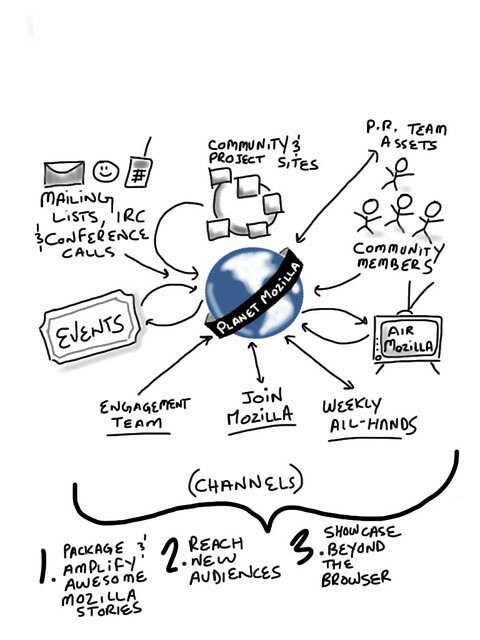 Another challenge is telling the unfolding Mozilla story. Not the big-picture feel-good story, but the hundreds of micro stories that make the big stuff possible every day. It’s a challenge that I was lucky enough to explore with Mozilla’s “Chief Storyteller” Matt Thompson several times this year. Each conversation left me more inspired to keep pushing the boundaries of what might be possible for a re-invented Planet Mozilla. It’s a challenge that people like Lucas Rocha are thinking about also, as Mozilla roles out its new Contributor Stewards initiative. It’s a challenge that Ben, Brett, Dan, Michelle, and Jessica are no doubt all thinking about in their respective projects. And it’s a challenge that is being voiced with more, and more frequency in the Mozilla-verse at large. Mozilla is all about “hacking at the core,” so here’s the invitation: Let’s hack at the core of Mozilla’s story and iterate it toward something we can all be a part of and proud of.